It’s starting early. We’re seeing foliage season creeping in with leaves already starting to turn. And for August, we’ve had some wonderfully cooler days. This fall foiliage is a little more special as it’ll be my first living in Vermont. As September ages and slips into October we’ll be exposed to a blanket of amazing reds, yellows and oranges. We’ll try to keep you all up-to-date through out the season starting right after Labor Day and our official September 9th re-opening. Vermont has the most vibrant fall foliage in the northeast. As Vermont is 76 percent forested and home to more than 50 state parks, leaf peepers can view expansive foliage across more than 300,000 acres of state-owned forests beautifully contrasted next to farm valleys, towns and waterways. We’ll be following Vermont.com and VermontVacations.com’s Foliage Reports and linking to some wonderful photos at Vermont.com’s Autumn Photo Gallery—photos shot by local photographers and visitors to Vermont. Part of our reporting will be coming from the US Forest Service, the Vermont Department of Tourism and any “leaf peepers” who update us. 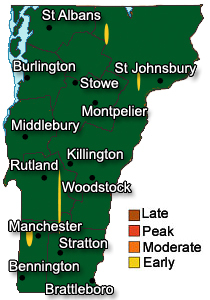 The map here is from Vermont.com and gives an approximate view of the current foliage color in Vermont.